I've come realize that I need to really limit the amount of garden stuff that is going to go back into the shed once it is an office space. To that end, it makes sense to avoid putting the shelves I had in there before back in, or the temptation to stuff junk in them will be all too real. That means that this entire wall will be free of furniture. I thought it made sense to add one more row of studs so that I can use them as display shelves. 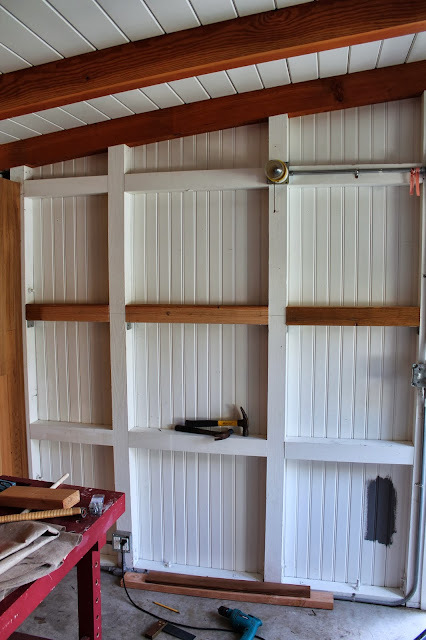 I bought one 10 foot 4x4 at Discount Builders on Sunday and used Simpson ties to hang them. I think this is going to be good once it is all painted out.